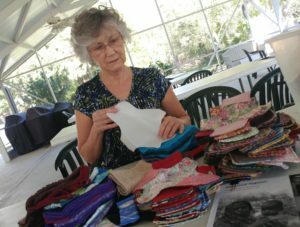 Tina Noel works with GRACE Project and the Unitarian Universalist Church in Fort Myers to produce hundreds of cycle kits. But not everyone has access to feminine hygiene supplies, and this is not a trifle. It’s simple: Without hygiene products women can’t go to work or stay in school. Days for Girls, an international non-profit, is dedicated to providing women around the world with the supplies they need. Given women menstruate about two months out of a year, this project is part of a larger mission to address poverty, hunger, education, gender equality, economic growth and sustainable communities. According to Days for Girls statistics, once these kits were distributed in Kenya, girls’ school absenteeism dropped from 25% to 3%. In Uganda, absenteeism went from 36% to 8%. This mission has come to SW Florida. “If we really want to help people, we provide the tools, namely education and the ability to work,” said Tina Noel. “If women are educated and can work, there is no stopping them,” she said. In 2014, Noel and the LaBelle Women’s Club made 500 sanitary product sets destined for Malawi. Today, Noel, working with the GRACE Project of the Unitarian Universalist Church of Fort Myers, is organizing volunteers to sew hundreds more kits for Guatemalan women and girls. Each set comes in a drawstring bag and contains underwear, two snap-on shields, eight liners, one waterproof barrier, one washcloth, soap and two Ziploc bags. Noel stressed the sustainability of the kits. They are high-quality cotton, and they can be easily washed with dishwater in the Ziploc bags. Unlike the non-biodegradable pads and tampons, these kits will last for three years. What makes these Cycle Kits unique is they include a Fertility Bracelet. According to Genelle Grant, director of The Grace Project advisory board, the Fertility Bracelets are a GRACE project invention which is invaluable for rural and Catholic women. Once women learn how to track their fertility on the beaded bracelets, they have a no cost, non-chemical birth control for life. “Along with the sustainability of the sanitary products, the Cycle Kit gives a woman more control of her life and procreation,” Grant said. One can only recall with admiration Kiran Gandhi, the runner who completed the 2015 London Marathon with menstrual blood running down her legs. She claimed she ran without a tampon to raise awareness about women around the world who have no access to pads or tampons. She also said she wanted women to realize there was nothing shameful about their periods. This blood is the blood of life, and it’s time women wore it as warpaint. Period. Also, the Unitarian Universalist Church of Fort Myers needs sewing volunteers and donations. Call 239.561.2700 or visit www.uucfm.org. All donations for the Cycle Kits must be marked “GRACE Project” and mailed to Unitarian Universalist Church, 13411 Shire Ln, Fort Myers, FL 33912. I am sending a donation today to the church address for The GRACE project. I would like to sew with you and for women. I will know my schedule later in January and will contact you after that to see how I can help. If you have any need of a sewing machine, I have an old Viking portable one in good shape I could donate. It is a rugged well loved machine that has served me well over many years. Thank you. I am so moved by your work having just heard of it on NPR on Thursday.